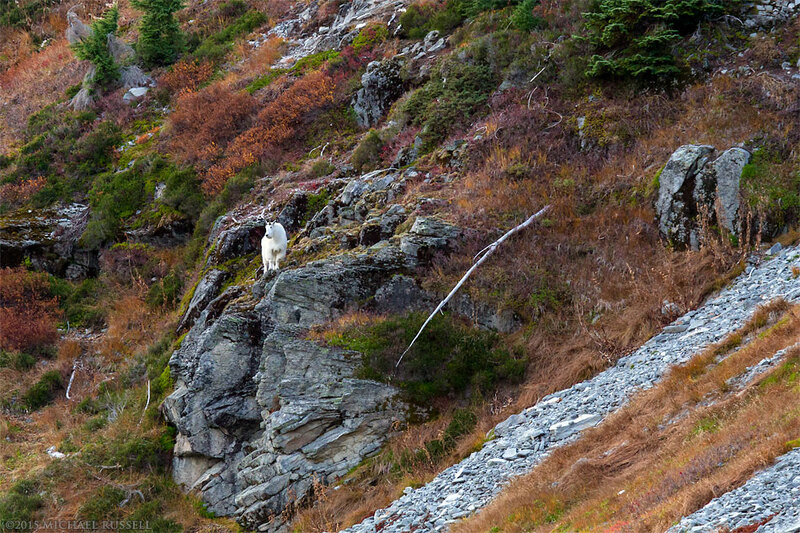 A Mountain Goat (Oreamnos americanus) climbing the southern side of Table Mountain at the Mount Baker Wilderness in Washington State, USA. In my last post I mentioned walking a few kilometers out on the Chain Lakes trail from Artist Point in the Mount Baker Wilderness. I made several landscape photographs at sunset while out there, including my previous post showing the panorama of Mount Shuksan. When first heading out on the trail I stopped and was going to wait for a hiker (wearing a lot of white) further out on the trail to pass though one of my compositions. As it turned out, this was a Mountain Goat (Oreamnos americanus) which I had forgotten were even a species I might discover here. Apparently they are fairly common in the Ptarmigan Ridge area but there are only about 2 800 in Washington State overall. Last year in a nearby location on the Table Mountain Trail I photographed a small flock of Sooty Grouse which I had also happened upon by chance. I was quite happy to find wildlife there two years in a row – especially in the case of the Mount Goat as I had never seen this species before. I don’t have any super telephoto lenses, so I made do with my 70-200mm lens and the 1.4x extender I keep in my bag for occurrences just like this one. Animal portraits are nice, but sometimes I prefer photographs of wildlife in the context of their environment. Headshots don’t show the environment animals live in. Perhaps I have partly formed this opinion because I lack the long telephoto lenses that most wildlife photographers carry with them. I bought a car instead! Usually when I am in an area where I expect to run into wildlife I review what one should do when you encounter it – so I am familiar with how to deal with Bears and Mountain Lions but not Goats. I stayed well back on the trail as it was walking along the trail towards me initially. I don’t believe Mountain Goats get agressive for no reason, but I stayed out of its just in case (and my bear spray was in the trunk of my car where it is not that useful). After it walked up the slope briefly I continued up the trail, got into a better position, and made this photograph. He or she was nice enough to pose for a few minutes (while watching me warily) while I made some images. For more of my photographs of wildlife visit my Animals and Wildlife Gallery.